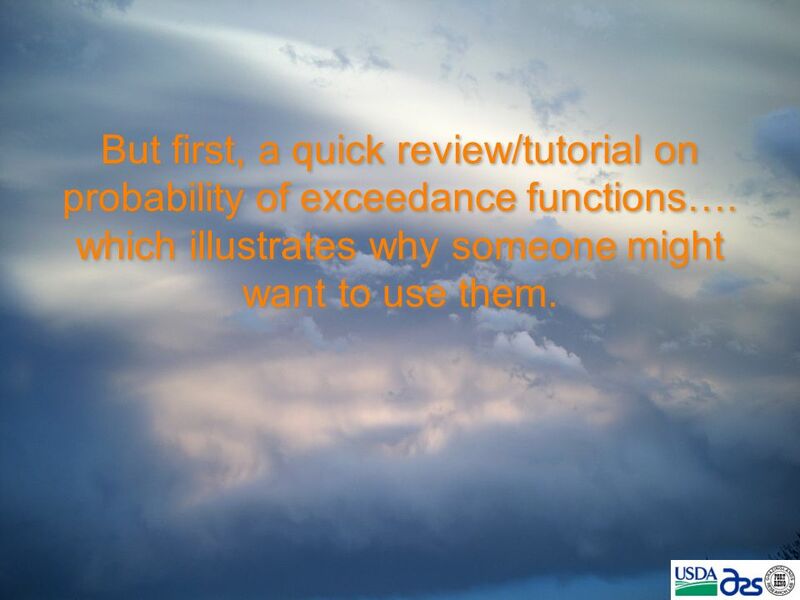 2 But first, a quick review/tutorial on probability of exceedance functions…. which illustrates why someone might want to use them. 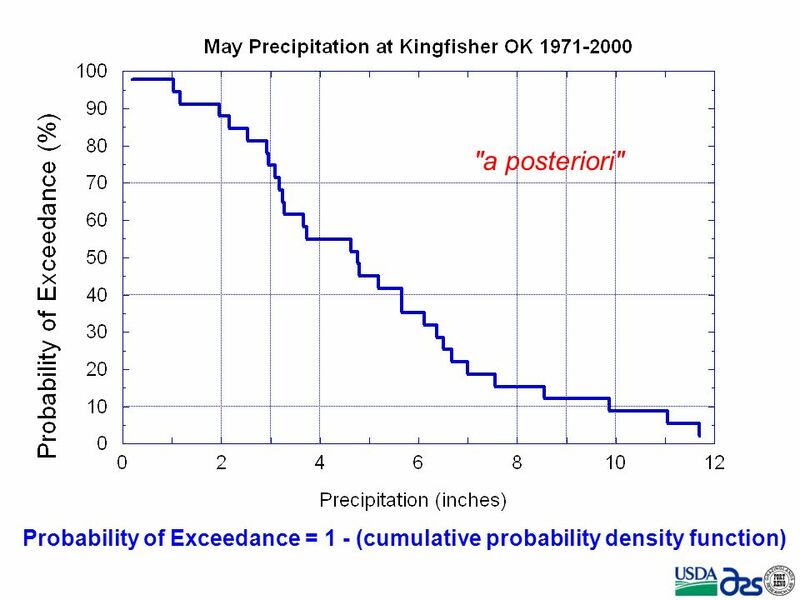 6 Probability of Exceedance = 1 - (cumulative probability density function) "a posteriori"
7 Precipitation (inches) Probability of Exceedance (%) 67% 3.2 Two in three chance for more than 3.2 inches. 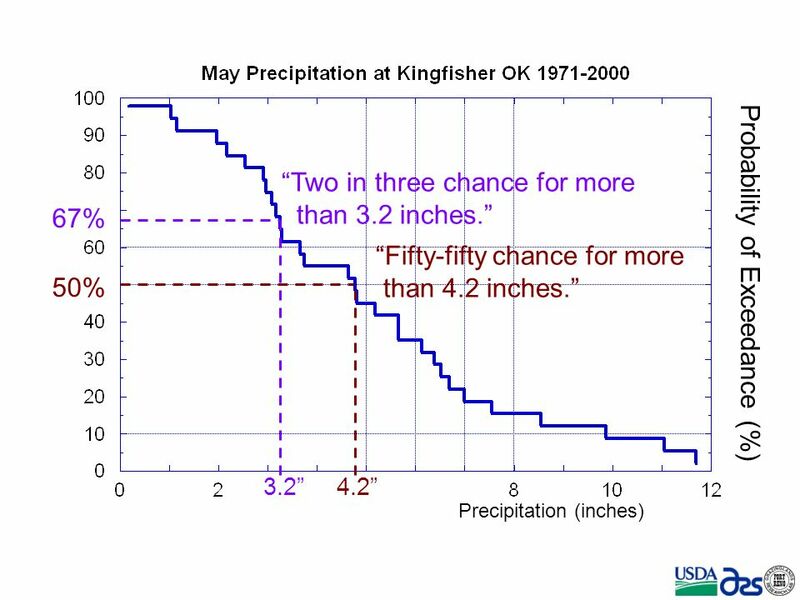 8 Precipitation (inches) Probability of Exceedance (%) 67% 3.24.2 50% Two in three chance for more than 3.2 inches. Fifty-fifty chance for more than 4.2 inches. 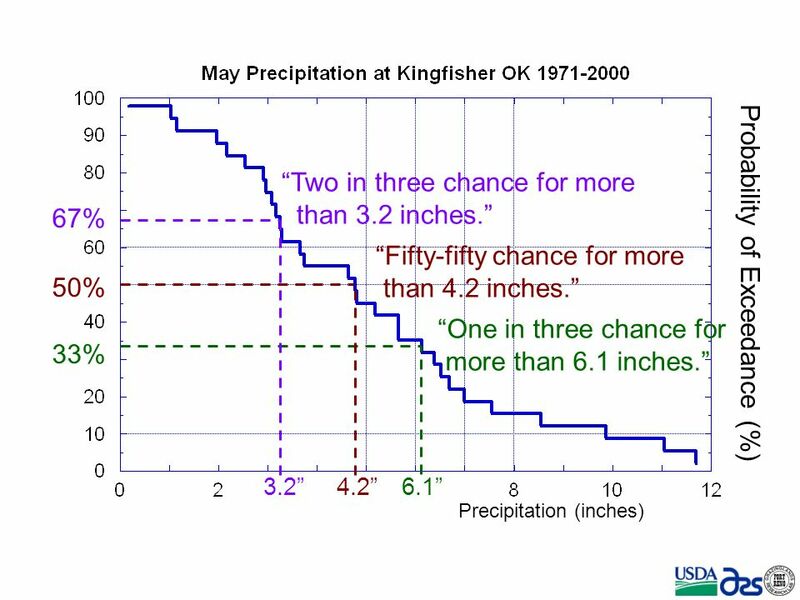 9 Precipitation (inches) Probability of Exceedance (%) 67% 33% 3.26.14.2 50% Two in three chance for more than 3.2 inches. Fifty-fifty chance for more than 4.2 inches. 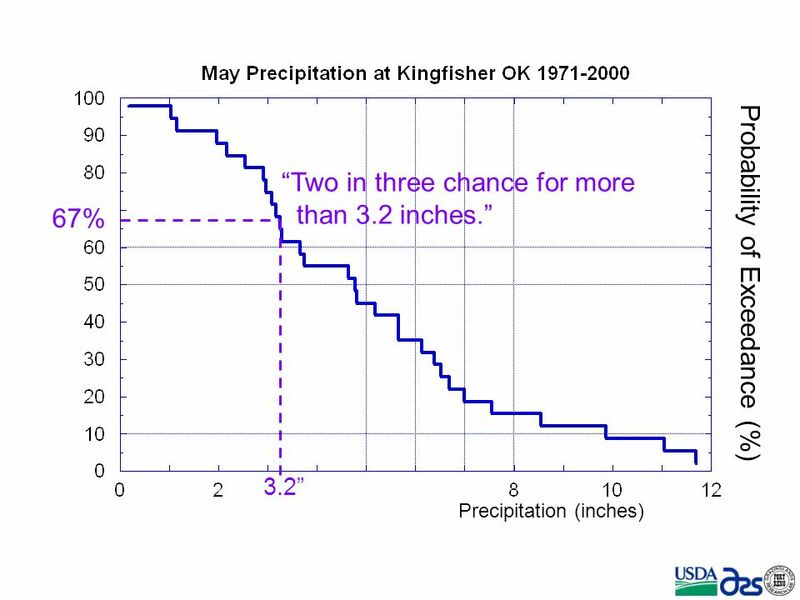 One in three chance for more than 6.1 inches. 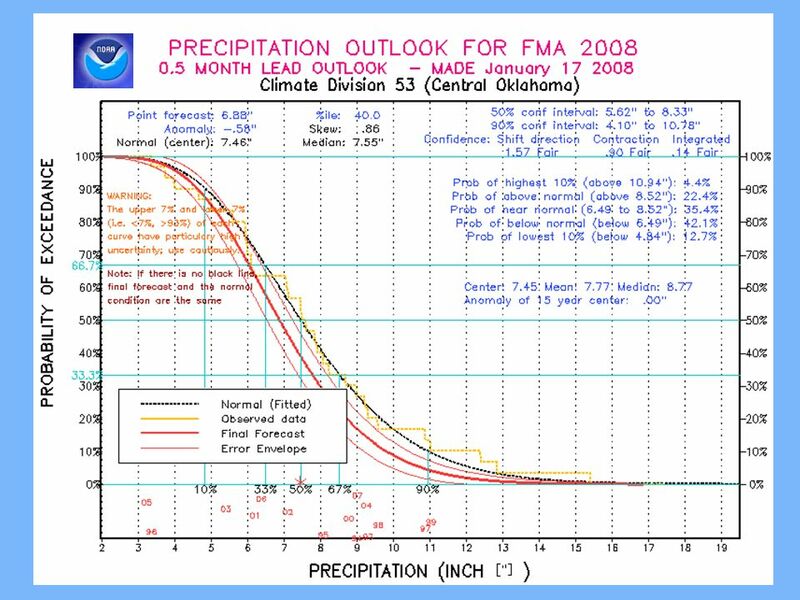 10 Precipitation (inches) Probability of Exceedance (%) 67% 33% 3.26.14.2 50% Two in three chance for more than 3.2 inches. Fifty-fifty chance for more than 4.2 inches. One in three chance for more than 6.1 inches. If you can associate a potential financial loss with each of these outcomes, then you have a definition of risk. 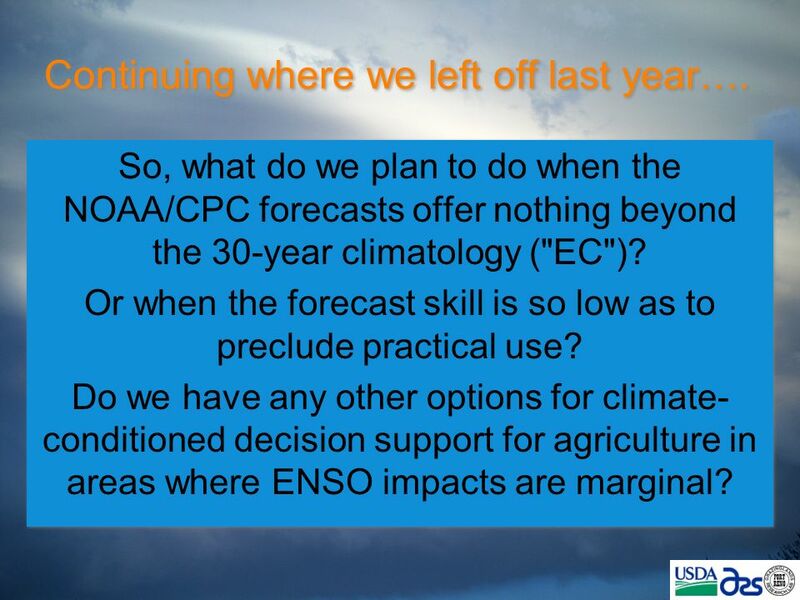 12 So, what do we plan to do when the NOAA/CPC forecasts offer nothing beyond the 30-year climatology ("EC")? 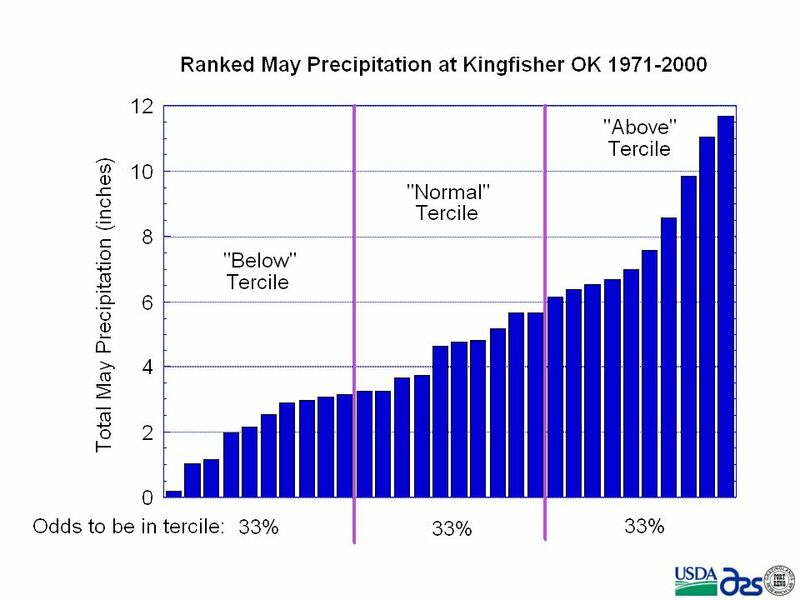 Or when the forecast skill is so low as to preclude practical use? 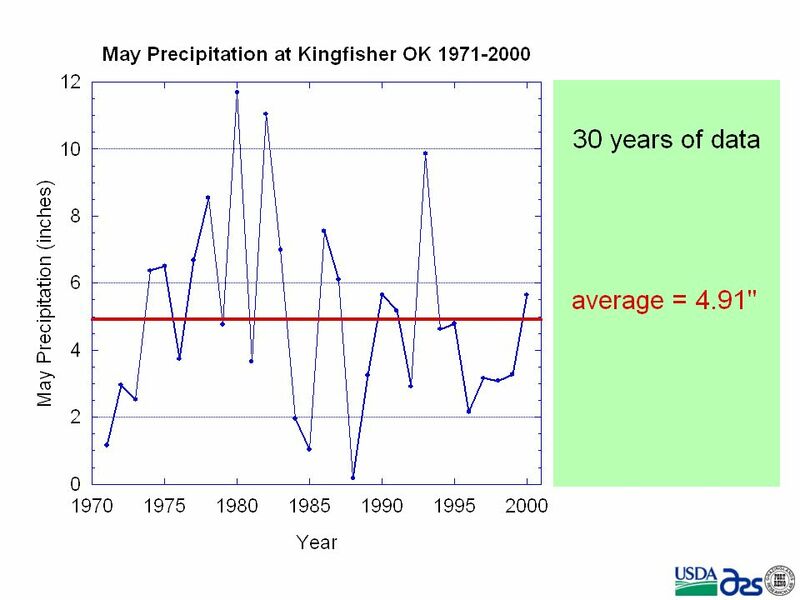 Do we have any other options for climate- conditioned decision support for agriculture in areas where ENSO impacts are marginal? 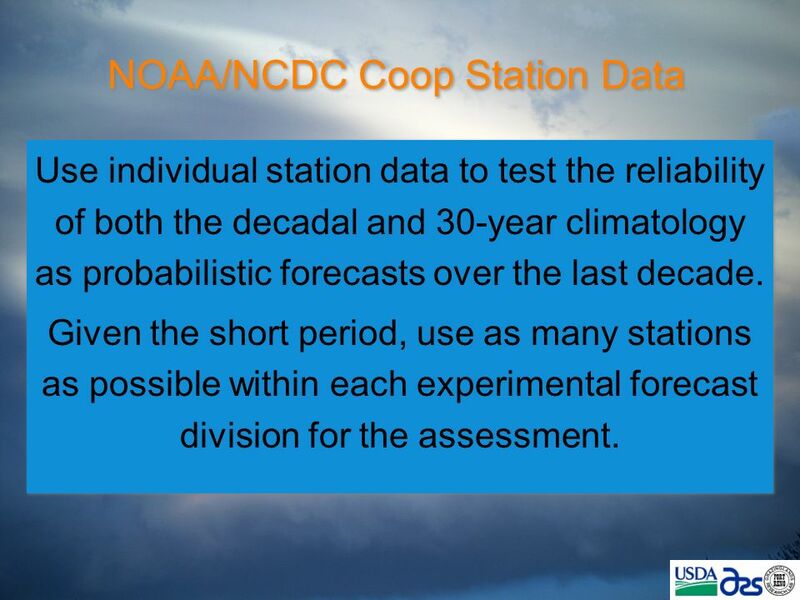 So, what do we plan to do when the NOAA/CPC forecasts offer nothing beyond the 30-year climatology ("EC")? 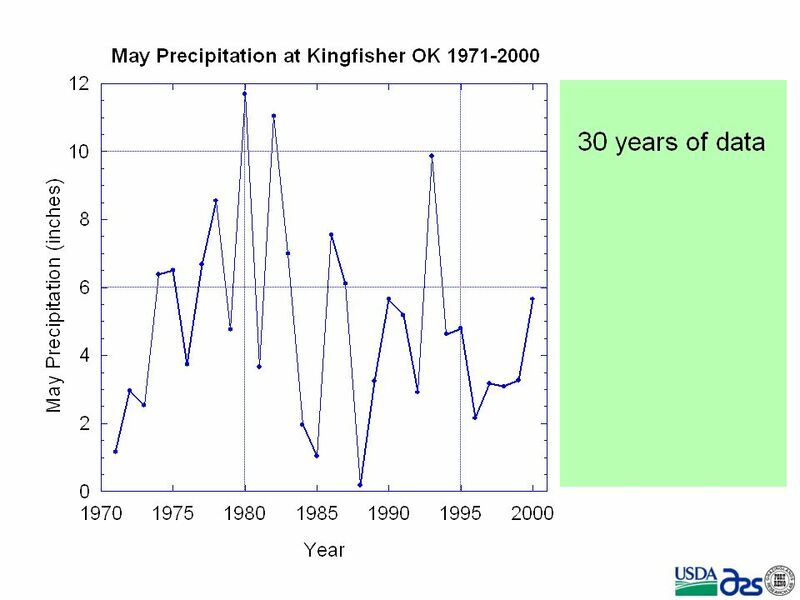 Or when the forecast skill is so low as to preclude practical use? 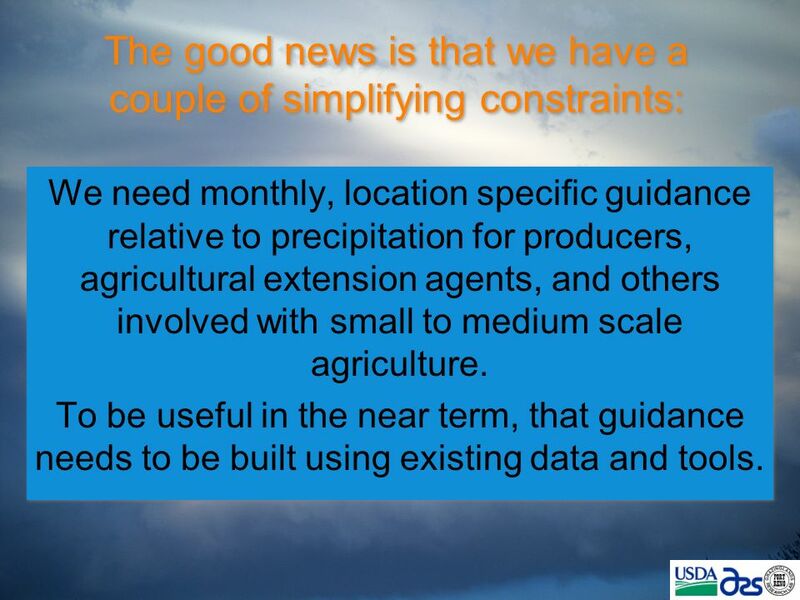 Do we have any other options for climate- conditioned decision support for agriculture in areas where ENSO impacts are marginal? Continuing where we left off last year…. 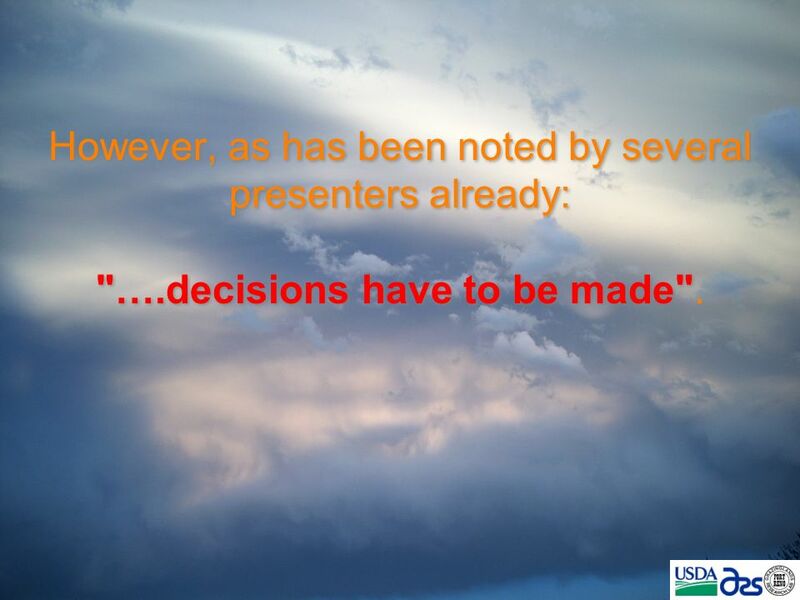 17 However, as has been noted by several presenters already: "….decisions have to be made". 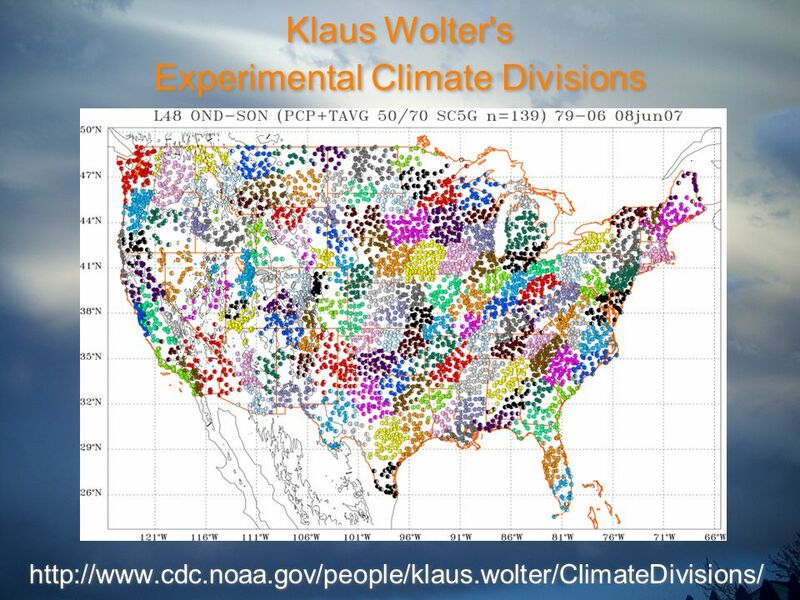 21 Klaus Wolter's Experimental Climate Divisions http://www.cdc.noaa.gov/people/klaus.wolter/ClimateDivisions/ Because these are based on precipitation variability, I will use these experimental climate divisions to define "location specific". 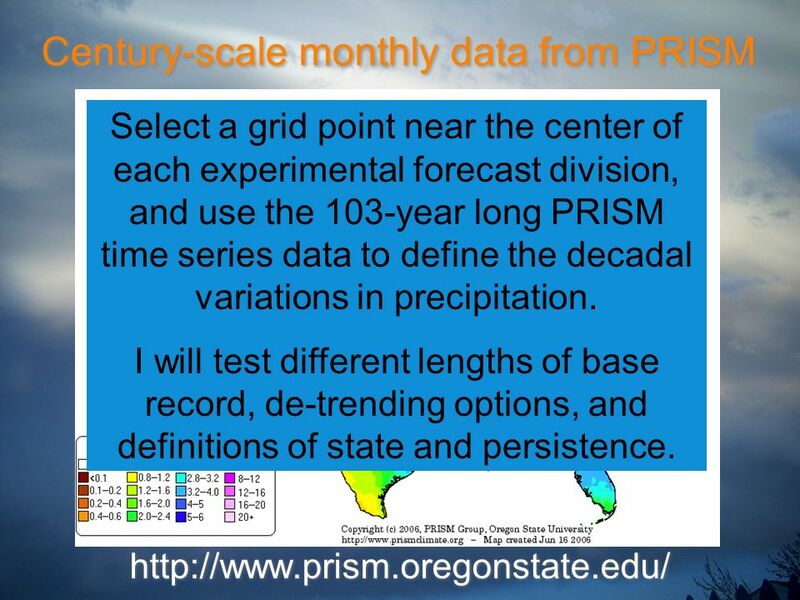 22 Century-scale monthly data from PRISM http://www.prism.oregonstate.edu/ Select a grid point near the center of each experimental forecast division, and use the 103-year long PRISM time series data to define the decadal variations in precipitation. I will test different lengths of base record, de-trending options, and definitions of state and persistence. 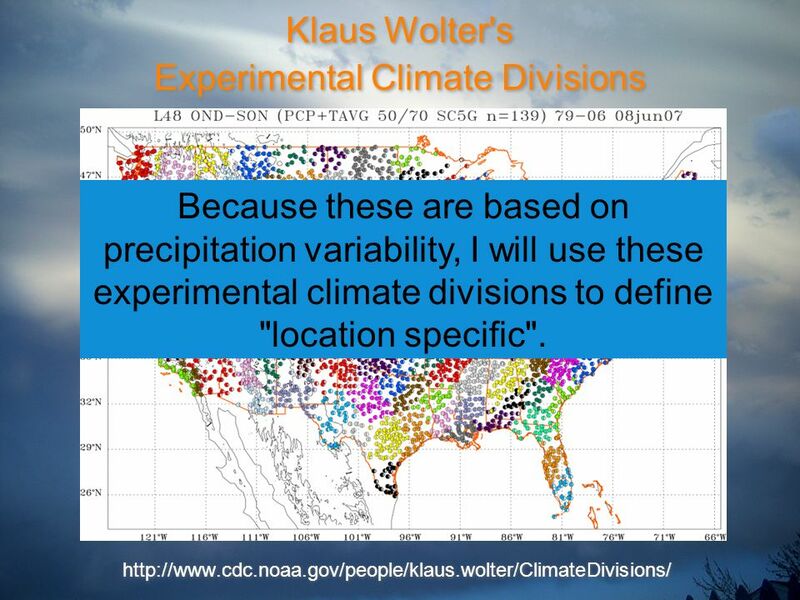 24 Conceptually, this is so simple it can be done graphically for each month and experimental forecast division. 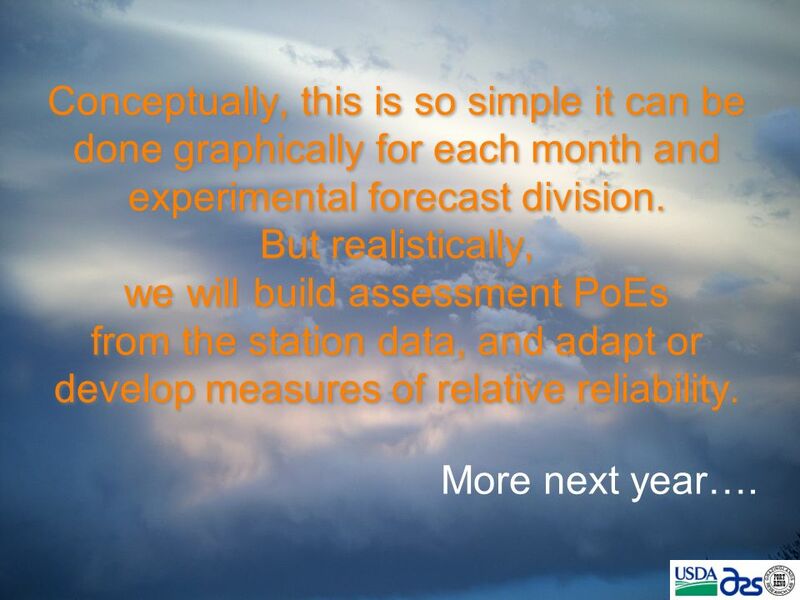 But realistically, we will build assessment PoEs from the station data, and adapt or develop measures of relative reliability. More next year…. 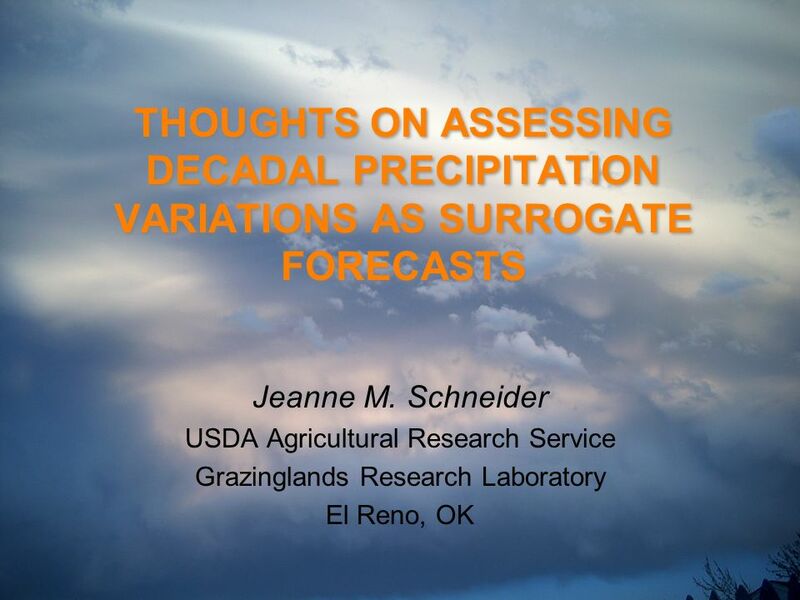 Download ppt "THOUGHTS ON ASSESSING DECADAL PRECIPITATION VARIATIONS AS SURROGATE FORECASTS Jeanne M. Schneider USDA Agricultural Research Service Grazinglands Research." 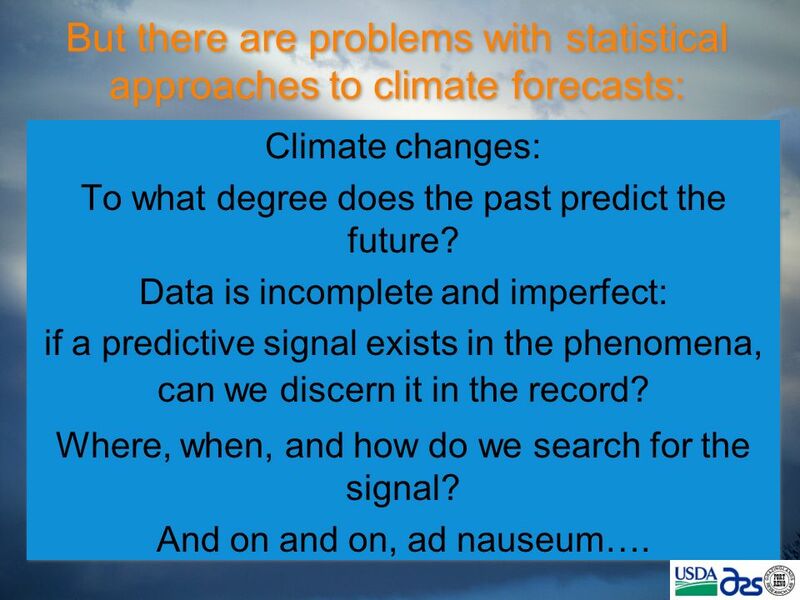 : A service of the Southeast Climate Consortium C. Fraisse, D. Zierden, and J. Paz Climate Prediction Application Science Workshop Chapel Hill, NC March. DROUGHT MONITORING SYSTEM IN DHMZ National Seminar on Drought Management 16 th April 2012, Zagreb Ksenija Cindrić, D. Mihajlović, J. Juras L. Kalin, B.
American Monsoons-ENSO teleconnection Vasu Misra, Dept. of Earth, Ocean and Atmospheric Science, Florida State University 1. 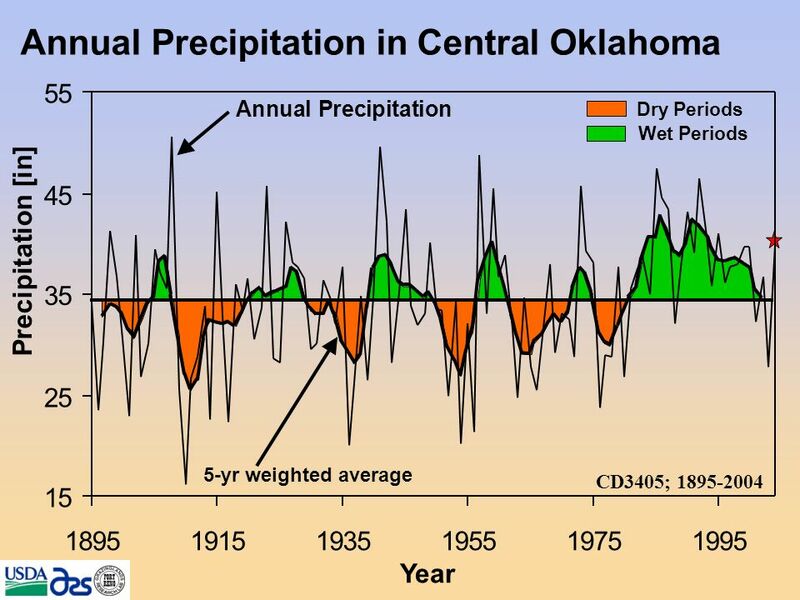 Climate Tools & Data. 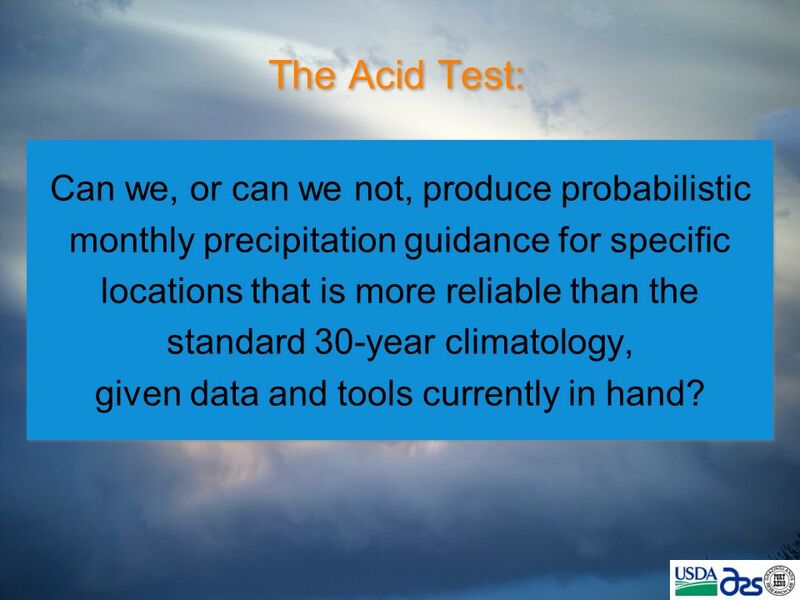 Note: This slide set is one of several that were presented at climate training workshops in Please visit the SCIPP Documents. Februar 2003 Workshop Kopenhagen1 Assessing the uncertainties in regional climate predictions of the 20 th and 21 th century Andreas Hense Meteorologisches. 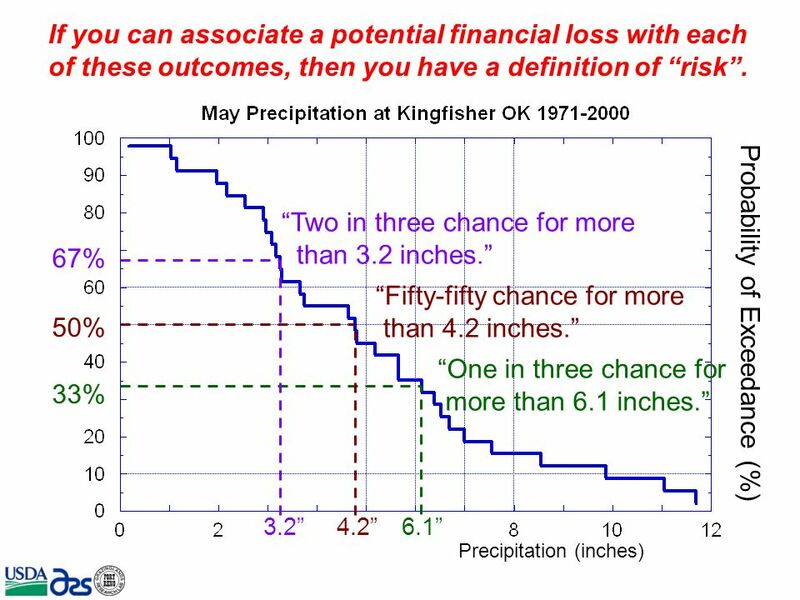 Introduction to Probability and Probabilistic Forecasting L i n k i n g S c i e n c e t o S o c i e t y Simon Mason International Research Institute for. 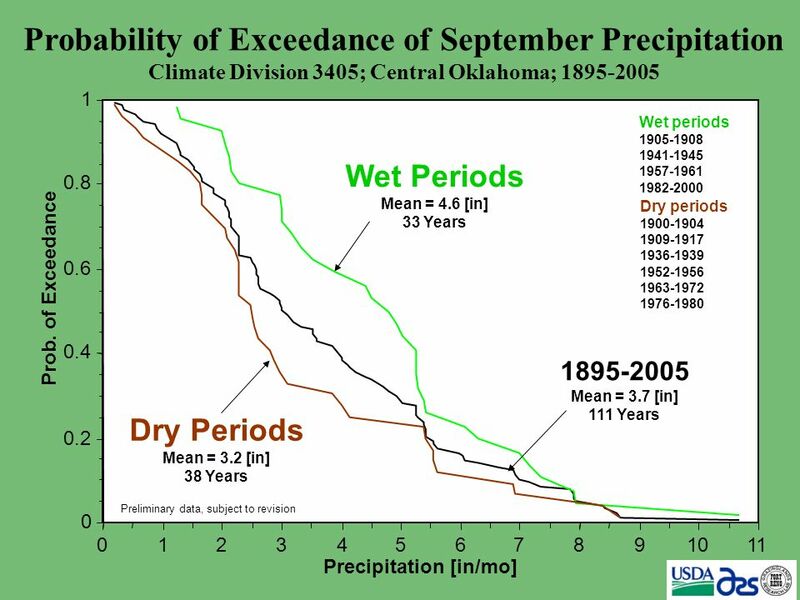 California and Nevada Drought is extreme to exceptional. 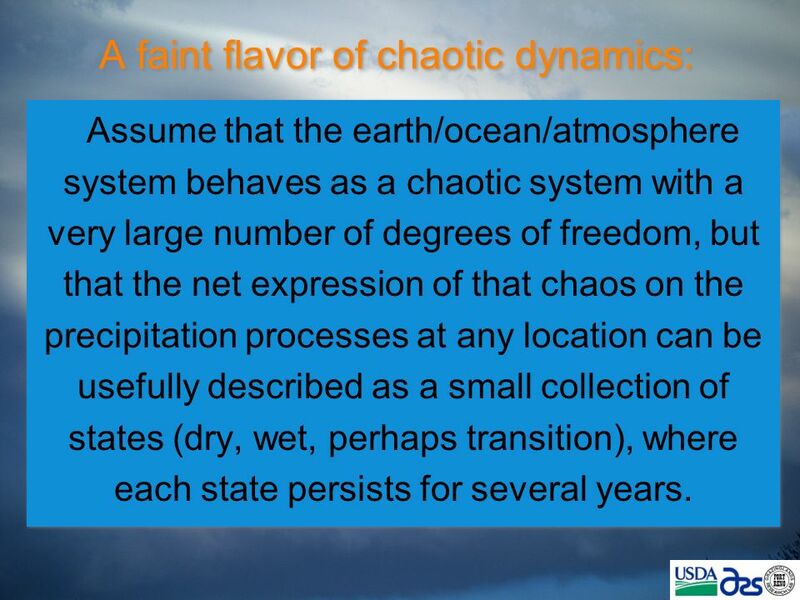 Dennis P. Lettenmaier Alan F. Hamlet JISAO Center for Science in the Earth System Climate Impacts Group and Department of Civil and Environmental Engineering. 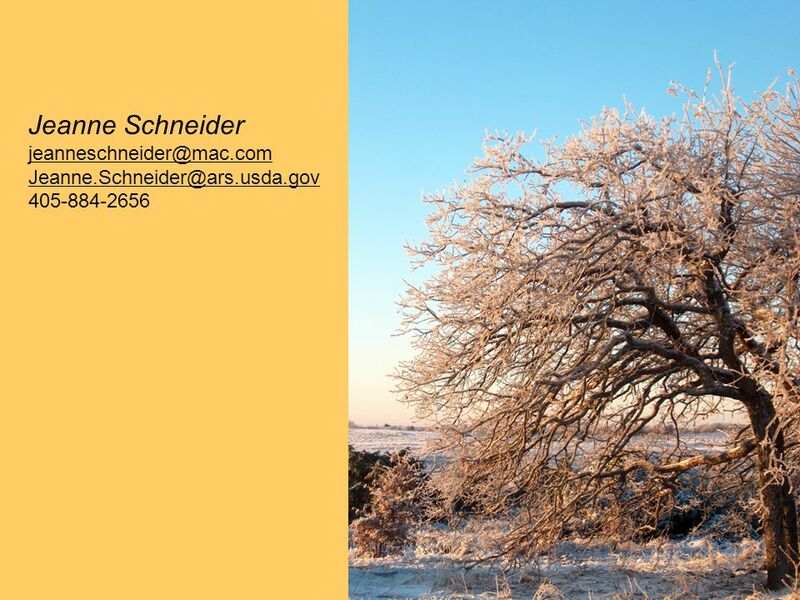 Climate Recap and Outlook for Winter Eric Salathé JISAO Climate Impacts Group University of Washington.